Apricot kernels, almonds, sugar, egg white: these are the genuine ingredients of Demil Classic Macaroons. 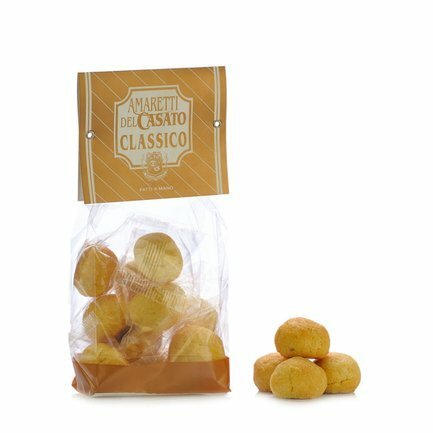 These soft biscuits are strictly hand-made by expert craftspeople in a process that adds greatly to the flavour and quality of the finished product. The Classic Macaroons are perfect for serving to guests and make an original gift that is enhanced by the hallmark of tradition. Ingredients Apricot kernels and almonds (mix 48%), sugar, egg white; Baking powder: ammonium bicarbonate; Preservative: potassium sorbate, natural flavourings. ALLERGENS: Eggs and egg-based products, nuts (almonds, hazelnuts, walnuts, cashew nuts, pecan nuts, Brazil For more information on product labels, please contact our Customer Service department. The information on the labels of the products may vary for reasons beyond our control, therefore, there may be discrepancies between the information on the site and that on the products delivered. Please always check the information on the product before consumption or use. Demil was formed at the end of the '90s with the aim of making natural and authentic products all sharing the core ingredients of 'quality and passion'. Through time, thanks to the resolve, commitment and relentless quality-oriented research, the small scale business was transformed into a prestigious artisanal bakery producing a range of exquisite sweets. Savour a delicious Demil product and you'll immediately understand the authenticity of the ingredients, the respect for the original recipe and the painstaking preparation. Demil's experience and hallmark quality have been officially recognised with an artisanal excellence award.